I assume there are those out there who look at this movie as nothing but glorification of muckraking journalists they see as politically biased (and unable to hold that same mirror up themselves). Instead, I'll argue that this may be one of the most singularly patriotic movies ever made, one about people exercising their Constitutionally granted rights to challenge democratically elected citizens with temporary stewardship of the government and share their findings, the system essentially lurching into gear to fix itself in the wake of these revelations. And it is gutting to know that in today's environment, no matter the evidence obtained, a good number of Americans would rather set themselves on fire than admit their guy was maybe up to no good (and, honestly, Watergate seems like penny-ante stuff compared to our current potential bombs). 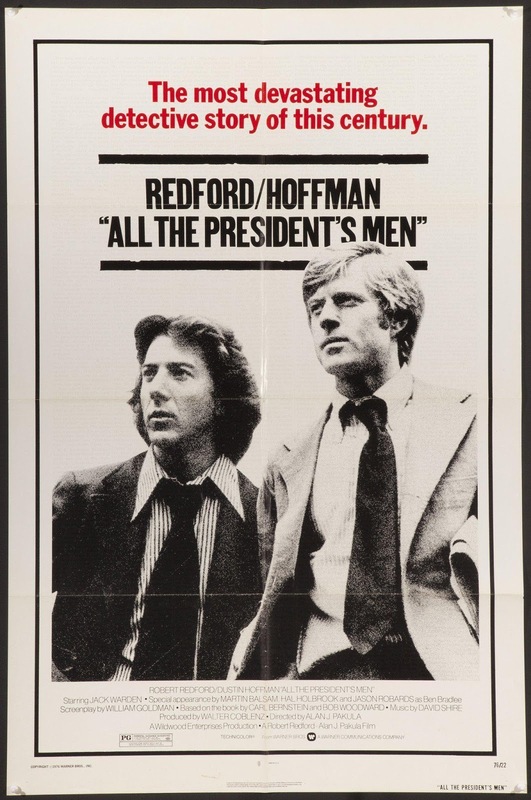 Directed by Alan J. Pakula, it's a story told almost clinically, with the same driving need to present the facts and how those facts were assembled that the journalists required to tell their own story. There's no padding, no character moments not tied to the story of Woodward and Bernstein uncovering the corruption in CREEP. We don't even learn the marital status of either character, and never really hear them discuss anything but what's before them. Character moments are told through camera work and deft acting from two of America's best at the top of their game. And, hey, those guys are supported by the likes of Jack Warden and Jason Robards. Not bad. In 76' when the film was released, the wounds of Nixon's resignation were still raw. Some ideas and names are taken almost for granted if you haven't Googled Watergate in a while. There's no time between the events of the film and when film was released - at least not enough to begin to sentimentalize the era or people involved. Instead we get a play-by-play for the public, who likely mostly learned of what occurred in follow up reporting, not as the Washington Post ran the initial stories. But something about that clinical approach doesn't just work as a "just the facts" representation of what works, it allows someone in 2019 to understand what happened, but also not to make superheroes out of our reporters. These are citizens like you and me, only with a press badge. While it'd be worth digging up a doc on the topic, it's astounding to see film bring events like this to life. If you've not seen the film in a while, it's worth revisiting. If you've never seen it, do.